Join the Fleas at Bethel's premier coffee emporium. We will be joined by special guest Uncle Zac for an eclectic evening of ukulele tunes. Admission free, tips appreciated. Specialty coffees and desserts for your enjoyment. Vic Schwarz passed away on September 3 following a 14-year battle with cancer. He was 76 years old. Greg was a longtime member of Vic's band, Acoustic Workshop. Wendy joined more recently. We will miss him very much. You CAN eat the scenery! Enjoy a real garden party: Cocktails and dinner in the garden of artist/designers Grace Kennedy and Tim D'Acquisto, with entertainment by the Fleas -- all to benefit the Garrison Arts Center. 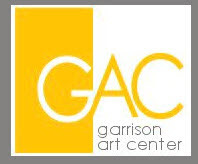 Visit http://www.garrisonartcenter.org/ to register, or contact us: edukatedfleas@edukatedfleas.com for more info. 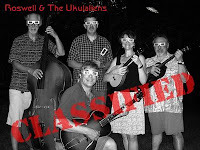 Come hear our larger band, Roswell and the Ukulaliens, in concert! We play an eclectic mix of tunes ranging from the 20s through the 70s, and feature clarinet, guitar and bass, along with ukuleles (of course!). Admission is free, but register with the library to attend. 860-267-6621 or online at http://www.easthamptonct.org/Pages/EastHamptonCT_Library/index, Events Calendar. The Fleas will be appearing at the Depot Restaurant, One Depot Square, Cold Spring NY, on Friday, September 12, with our friend, swing guitarist Peter C. North. Look for us in the bar, starting at 8pm. Come enjoy a great meal, a cold beer and some great swing music! We will be playing at the Norwalk Oyster Festival in our larger group Roswell & the Ukulaliens on Saturday Sept. 6th, 3:30pm, Waterfront Stage. The Oyster Fest is a three-day fun family event that includes crafts, vendors, food and music set at the historic South Norwalk waterfront. Advance sale tickets are available at http://www.seaport.org/OysterFestEntertainment.html and include all entertainment. Come and spend the day! Join the Edukated Fleas at the Farmers' Market, where you'll also find farm-fresh fruits and vegetables, wine, cheese and baked goods. 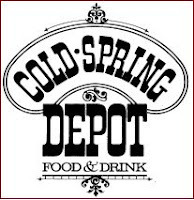 The Farmer's Market is held at 44 Chestnut Street (Route 9D) in the village of Cold Spring.